Mentioned is the way you can write. 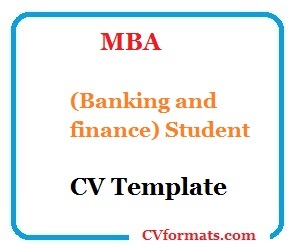 People looking for jobs can easily download these MBA(Banking and finance) Student CV Template in word or pdf format or just view it online to copy and paste. Cover letter of MBA(Banking and finance) Student CV Template is also available. Just change the name , address , qualification and experience and your MBA(Banking and finance) Student CV Template is ready. St.25 sec 12 A jamia masjid ummer farooq North Karachi, Pakistan. Objective My passion is to achieve excellence in my skills. I want to work in a challenging, progressive, competitive and responsibility driven environment that can help me to develop & enhance communication and decision making skills.